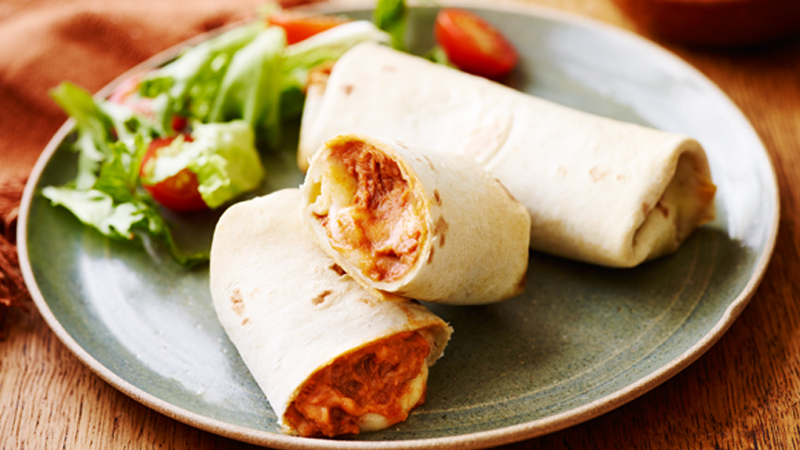 Spicy refried beans and grated cheese create the tasty filling for an easy-to-wrap veggie burrito. Preheat the oven to 180ºC (160ºC for fan assisted ovens), gas mark 4. Line a baking sheet with baking paper. Mix the refried beans and taco seasoning mix in a medium bowl. Divide the mixture between the tortillas then top with the grated cheese. 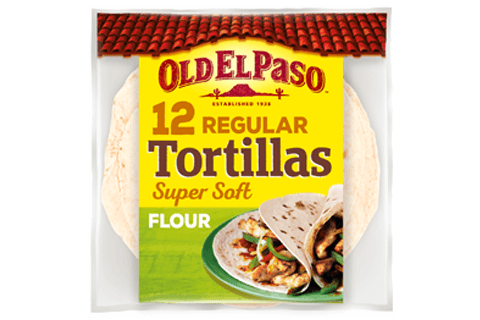 Fold over the ends and sides of each tortilla and roll up. Place seam-side down on the baking sheet. Bake for 12-15 minutes or until heated through. Serve immediately with salad leaves, halved cherry tomatoes and soured cream. Use any variety of cheese – try mozzarella or crumbled feta for a change of flavour. For a spicier filling top the cheese with some chopped sliced red jalapeños before rolling and folding.